Nauru Tower is Hawaii’s premiere luxury Condominium located near Ala Moana beach park and Waikiki in Honolulu on the island of Oahu. Experience prestigious living in Hawaii’s condominium of the year. 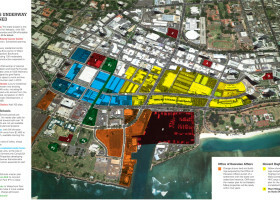 The bold design of Nauru Tower, the anchoring first of the three phases in a master planned Kakaako district improvement, fulfills that trust with the 418 foot stature of Hawaii’s tallest building. Nauru Tower’s 44 story, cast-in-place reinforced concrete structure employs an inner, box shaped “super core” wall system to control the possible lateral sway and twisting effects of hurricanes and earthquakes.